I read this article and found it very interesting, thought it might be something for you. 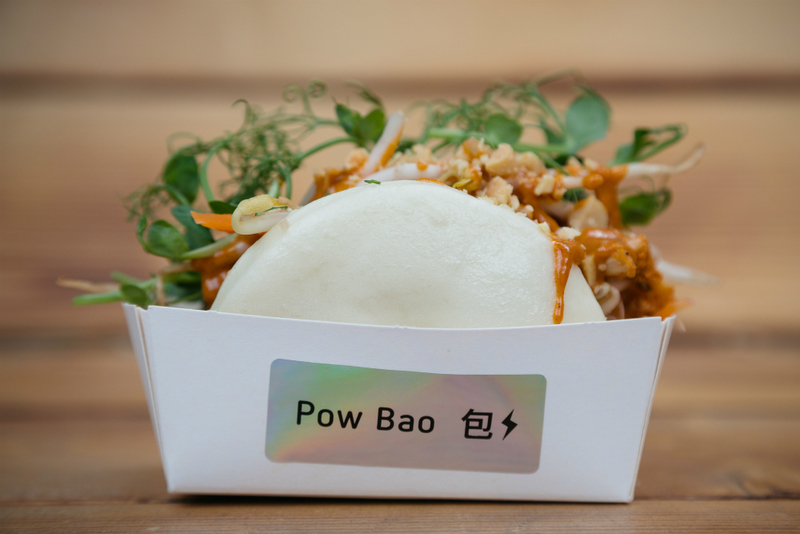 The article is called Pow Bao at Eatyard and is located at https://www.totallydublin.ie/food-drink/restaurants/pow-bao-at-eatyard/. “A change of direction next Wednesday could lead to a brighter future.” This is the oddly specific message curled inside my fortune cookie from Pow Bao, a food truck specialising in steamed buns from Taiwan stuffed with creative, savoury fillings. I’m at Eatyard on South Richmond Street and Pow Bao are just one of around ten food trucks parked in the lot next to The Bernard Shaw pub. The Bernard Shaw celebrated its tenth birthday last year, a major milestone for Bodytonic, a company that started out throwing parties with their DJ pals back in 2002. Bodytonic is now an extended family that includes five Dublin pubs, two major outdoor festivals in The Big Grill and Beatyard, and a new rural venture on the way in County Clare. It took two years of planning permission before Eatyard could officially open in late 2016, reopening in March of this year. Since reopening, the Eatyard stage has hosted events and cookery demos from Dublin heroes such as Colin Harmon of 3FE and chef Katie Sanderson of The Fumbally family and White Mausu. It’s a semi-permanent collection of refurbished shipping containers and food trucks, and it’s a street food market with a particular calibre of vendor. The stalls here are peddling in creativity as well as flavour, some more successfully than others. We’re not sure about the combination of diced dried mango to our cone of No Bones Chicken (€8). It’s a sweet vs savoury risk that just doesn’t quite pay off and we regret not going for the teriyaki sauce with crispy onions and chilli flakes topping. Next time. More traditional are the arancini (€4.50), sumptuously fat balls of deep-fried risotto from Lapa Street Food, a Sicilian stall. The grilled cheese from Cheesus looks outstanding but we go vegan with Veginity, the plant-based food truck recently awarded the Best Street Food at the Irish Restaurant Awards. We’re curious to try their vegan ‘fish’ and chips (€8). It certainly looks the part, but the vegan ‘fish’ is deep-fried cassava, a Brazilian tuber vegetable. The chips are a touch anaemic in colour but overall it’s a really interesting supper. But it’s Pow Bao that stands out for me. These sticky, almost sweet steamed buns are right up my street food street. Roy Hennessy had been living in The Netherlands for years and had launched his bao street food business over there. When he moved back to Ireland, the bao-less market here was ripe for the taking. Baos are big news in London and New York but, apart from Bread & Bones over on the North side, I haven’t come across many folks doing them here. His right hand bao man is young chef Paddy Hegarty. Pow Bao’s Bang Bang Bao (€6) is stuffed with shredded rotisserie chicken topped with crunchy beansprouts, micro herbs and crushed peanuts, doused in a delicious satay-style sauce. The Bao Chicka Bao Bao (€6) serves up piquant homemade kimchi and crispy fried chicken, and veggies are looked after too with the H’Avo Bao (€6), a combo of avocado, burnt pineapple and siracha salsa. Before a recent roadtrip, I swung by Eatyard to grab some baos for the journey.They had been on my mind since my first visit. It also happened to be the launch of Beatyard, Bodytonic‘s seaside festival that takes place in Dun Laoghaire on the August Bank Holiday weekend. In the festival’s honour, Pow Bao were doing a special bao stuffed with deep fried soft shell crabs layered in a wasabi sauce. It was awesome. When done right, baos have the potential to encapsulate all that is good in street food; small pockets of food you can eat with one hand that have the power to stop you in your tracks with the power of flavour. 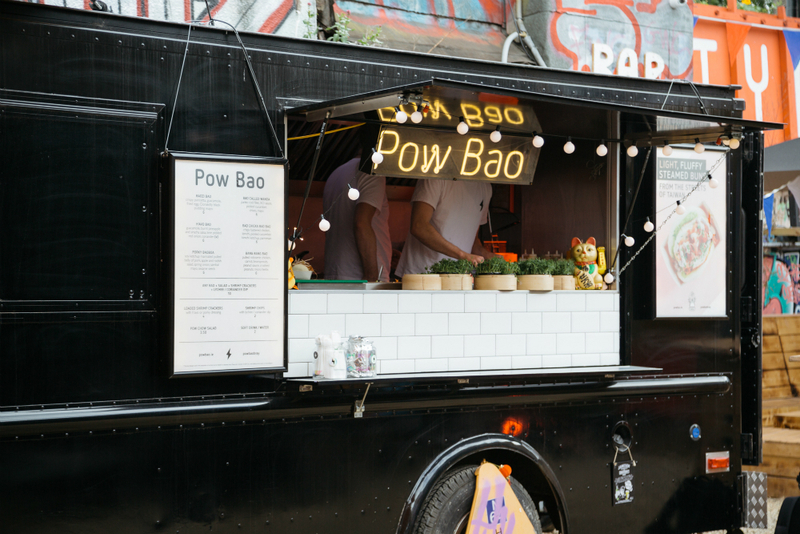 Pow Bao are doing it right. Eatyard is free in on Thursdays to Sundays from 12pm. Book a table for you and your pals through their website.